According to The Balance Careers, the average person today changes jobs 10 to 15 times during his or her career. One critical factor that people should decide on in conjunction with a job change is what to do with their employer-sponsored retirement plan. Most often these are 401(k) or 403(b) accounts. Take your money out in a lump-sum payout. Leave assets in the old employer plan. Roll over assets from the old company to a new company retirement plan. Roll over assets into one of three IRA options. Taking your money out in a lump sum is the one option that I would not recommend to anyone unless you have a financial emergency and you have no other possible sources of funds to cover a catastrophic event. These are certainly difficult situations, but until you have exhausted every possible option, I would not touch these assets. If you do decide to take money out, you will be subject to a 10% early withdrawal penalty unless you are older than 59.5 and you will be taxed at your ordinary income rate. There are a few exceptions that apply to the early withdrawal penalty, but the taxes are unavoidable. Your assets are, in essence, locked up. You can no longer make contributions to the plan and you can no longer access your money through a potential loan option if your plan even offers one. Increase in fees. Some plans won’t allow you to keep assets in a plan if you are no longer employed by the plan sponsor. If they do allow your assets to remain in the plan, it could be for a limited amount of time, and they could start charging maintenance fees to keep the account open. Limited investment options. Your investable options will always be limited to whatever options your company plan allows. Most plans only offer a limited lineup of mutual funds that can carry high expense fees while underperforming their respective benchmarks. A double negative. There are no penalties or taxes for rolling over assets from one qualified retirement plan to another when you change jobs. You may still be faced with limited investment options. Just like leaving your assets in your old plan, you are still limited to whatever options your company plan allows for in the plan, and those could be better or worse than your previous plan. If your new company offers a loan option as part of their retirement plan, then you would have access to your assets via a loan if you were to roll those assets over. Be careful though, most plans typically have a waiting period before you can even access a loan. It provides the most investable options. Within an IRA, you can invest in individual stocks, bonds and ETFs. Most employer-sponsored plans only offer mutual funds. An IRA allows you to create a diversified portfolio, usually at a lower cost. Lower costs. Depending upon your old company’s investment plan line up, the investable options (again, typically mutual funds) charge fees and in some case those fees can be very high, between 1% and 2%. No penalties or taxes for rolling over assets. Like rolling your assets over from an old plan to new plan, there are no penalties or taxes for rolling over assets from one qualified retirement plan to an IRA when you change jobs. Traditional IRA: If your previous plan had all pre-tax contributions which mean you have not paid tax on those assets, you would then roll those assets into a traditional IRA. 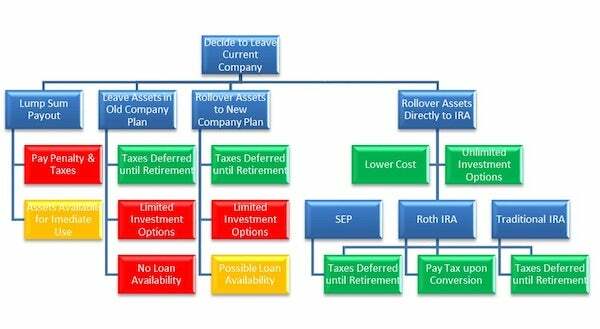 Roth IRA: Some plans now offer the option for an after-tax contribution such as a Roth, or a plan may allow you to make both pre- and after-tax contributions. Whatever the case, you need to align your contribution up to the correct IRA option to avoid paying any unnecessary penalties and taxes. SEP IRA: This is an option for small businesses to make pre-tax contributions to for both owners and their employees. Pre-tax contributions from another qualified plan could be rolled over into a SEP IRA.